A while back, I switched to a Boss GT-Pro driving 2 Thump (Mackie) TH-15A powered PA speakers. The only pedals I've kept in the chain are an old E-H Q Tron and a Korg G4 rotary speaker simulator (love that box). I've never been happier or enjoyed playing more. THD Univalve. 15 watts, but Andy Marshall's idea of 15 watts can be painfully loud. You can't stay in the room with it gained up on high power. I use it to record with and love it. Using stock (russian, chinese?) EL34 that came with it, presently. They say a Tung Sol 5881 is marvelous. PS I just generally plug straight in, no effects. Sounds absolutely massive. I can get Zoot Allures-esque tones to completely crushing metal tones. When I play smaller venues I use my Soldano Hot Rod 50+. Just plug my guitar straight through the amp. When I head out on tour or play different larger, more spacious venues I take my live rig and that has a Marshall 100/100 power amp through an ADA MP1 through an Eleven Rack, through a sonic maximizer. Good times. Pix below! MegaDroogie666: "...Soldano Hot Rod 50+..."
Looks like a MMJP in the bottom right corner in your Soldano pic, if my eyes don't deceive me. So you're already playing a very nice modern DiMarzio/piezo guitar. And still I don't doubt you're gonna love whatever Fly you will end up getting. 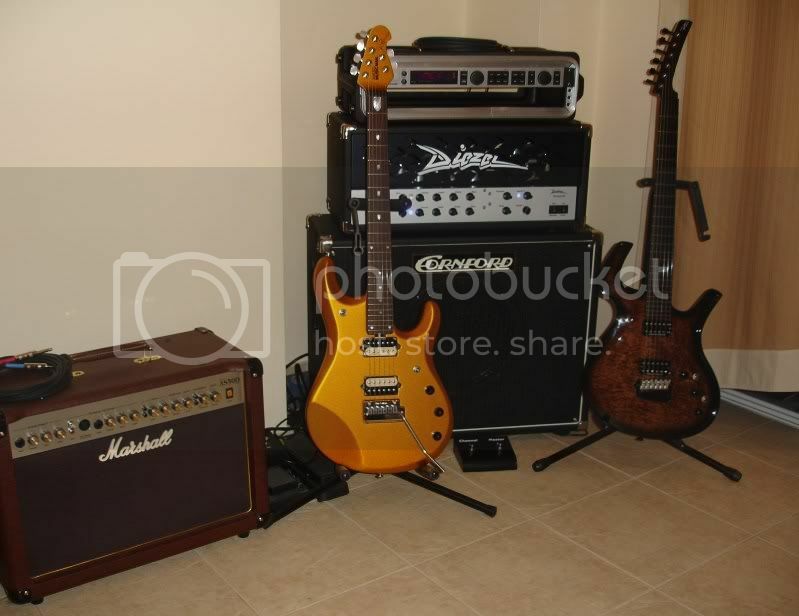 MegaDroogie666: Nice rig!!! Welcome on board. Yup! That's a MMJP7 right there. the only thing is 1. it's a seven string which is cool but at the same time it gets weird during gigs and a second thing is for some reason I have this weird vibe that a signature guitar is something you keep at home. Although I have gigged with this guitar. Heavy but still cool. For the past 8 months i've been using a Diezel Einstein.I hope it's ok to post a pic here. have a little 2x eL84 zinkey head, a boogie 20/20, GT Solo 2x eL34/6L6 head, a marshall 50x50, maybe some others can't remember. Just sold a THD bivalve head (not as nice sounding as a Univalve with a THD cab) and an AER Basic Performer (too heavy). Really miss the AER but now using 750 x2 single rack system power amp, searching for a piezo preamp-any ideas? So many great amp combinations listed here! I still run my G Major for effects. I do also leverage it for some useful EQ options. Coming from several previous Mesa models (20/20, Triaxis, F50, Express 5 50) the Renegade just somehow was a better "cup of tea" for my preferences. It's been re-tubed using KT66's/KT77's and a nice blend of preamp tubes. Favorite features would be the: Tube Mix dial, Bias tuning, EQ switches. Lots of versatility with little dial dancing.